Dysommina rugosa eels in Nafanua Eel City / Alia Expedition Home Page / free for non-commercial educational use. There is an unique place east from the easternmost Samoa island. 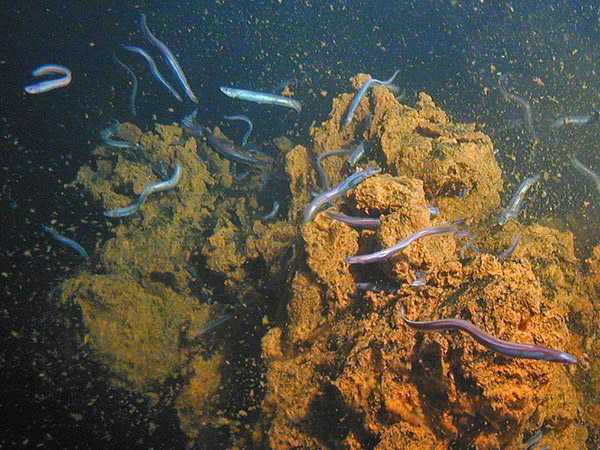 Deep under the sea a summit of new volcano is quickly rising towards the surface and thousands of rare eels are living on the summit of this volcano. This is the weird Vailulu’u Eel City. 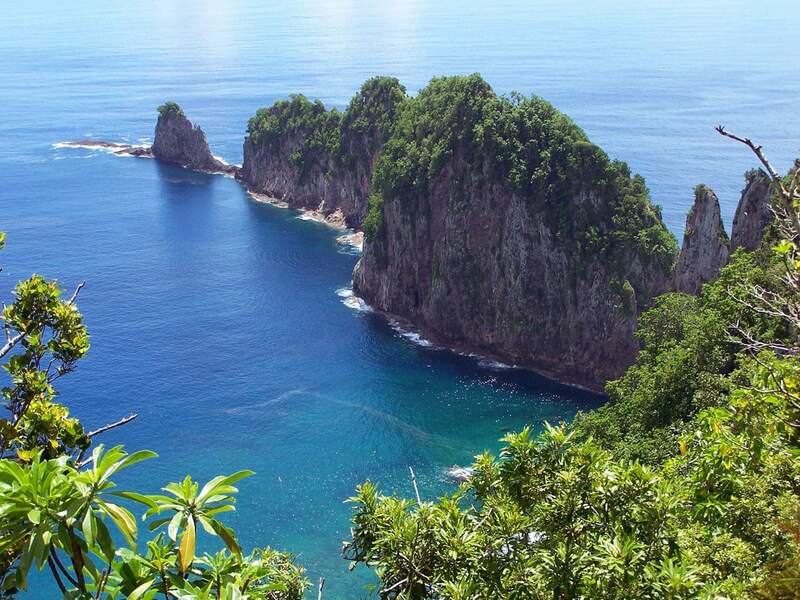 Samoa islands have been created by an interesting geological process. An enormous tectonic plate here is sliding towards the west and is pierced by volcanoes like a submachine gun shooting through the cardboard. In most "openings" the volcanoes have created mountains rising above the ocean – Samoa islands. It is expected that the next island will be Vailulu’u – a new volcano rapidly rising from the depths of the ocean to the east from the exotic Ta’u Island. This submarine volcano was discovered in 1975. It is a very large mountain – it rises 4,200 m from the ocean floor – but still has to rise 590 m to reach the sea level. At least it was like this in 2005 – further eruptions might have rised it further up. Vailulu’u has 2 km wide, round caldera, which is some 400 m deep. In 2000 this caldera was fairly flat, but in 2005 the NOAA researchers found a new volcanic cone inside this caldera. It rises 300 m from the bottom of caldera (rising up to 708 m below the sea level). This new volcanic cone was named – Nafanua. Dysommina rugosa eels in Nafanua Eel City / NOAA / public domain. 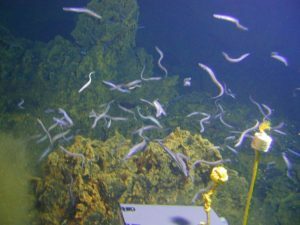 In 2005 the researchers dived nine times to the Nafanua with a submarine Pisces V. They were surprised to see rich life in this very new geological formation – the pillow lava was covered with yellow microbial mat and, most surprisingly – there were found hydrothermal vents near the summit, where the stones were teeming with countless cutthroat eels Dysommina rugosa. Cutthroat eels are bottom-dwelling, deep-sea fishes, resembling agile snakes. They are up to 37 cm long and have been found in rather many places around the world. Vailulu’u was the first place where they have been studied in nature. Most likely these eels just live among the volcanic stones and feed on crustaceans, which are floating by in the current. The vents in the top of Nafanua volcano are emitting a solution which contains toxic materials. This fluid is heavier than the water and is flowing down in the caldera of Vailulu’u, where it accumulates. Many sea animals die in this toxic water and the seabed around Nafanua is littered with carcasses of dead fish, squids, crustaceans. Only bright red, acid resistant polychaetes (Polynoidae) are busy eating microorganisms from these carcasses. Thus Nafanua has created two unique biotopes – the Eel City on the summit and the "Moat of Death" at its base. The volcano most likely here is very active and it is expected that in this century there will appear a new island. The Eel City will change a lot, but no one knows whether the eels will stay and be that many here. Craig Young, Hubert Staudigel Eel City and the Moat of Death: An Active Volcano on the Samoan Hotspot. Ocean Explorer, NOAA. Accessed on December 9, 2011. Youtube video. NOAA. Accessed on December 9, 2011. Pola Island / Tavita Togia, Wikimedia CommonsPublic domain, US National Park Service. 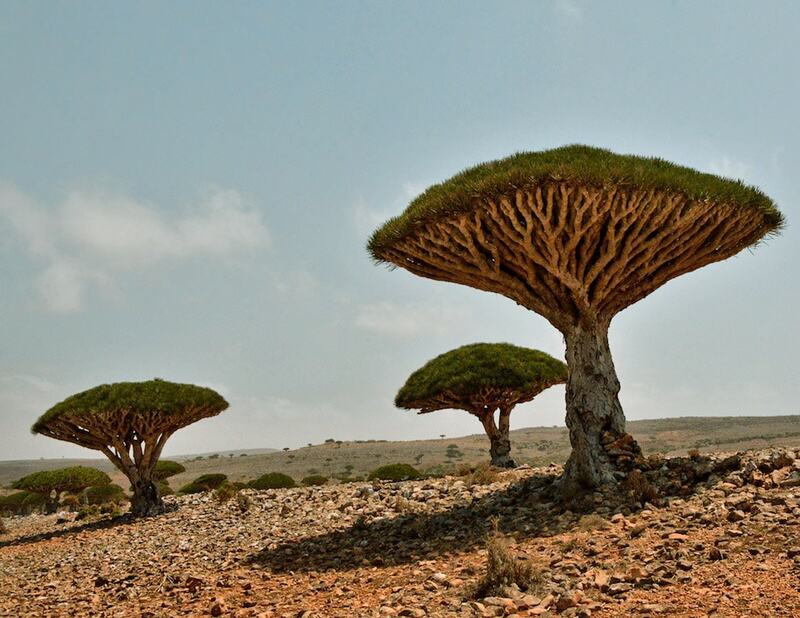 This small island country offers breathtaking scenery and interesting natural and archaeological landmarks. In The Fragile Edge, the documentary filmmaker and deep-sea diver Julia Whitty paints a mesmerizing, scientifically rich portrait of teeming coral reefs and sea life in the South Pacific. She takes us literally beneath the surface of the usual travel narrative, in an underwater equivalent of an African big-game safari. Scientists have mapped less than 10 percent of the ridge of underwater mountains in the middle of the Atlantic ocean. It is here that 95 percent of the volcanic activity on earth occurs. 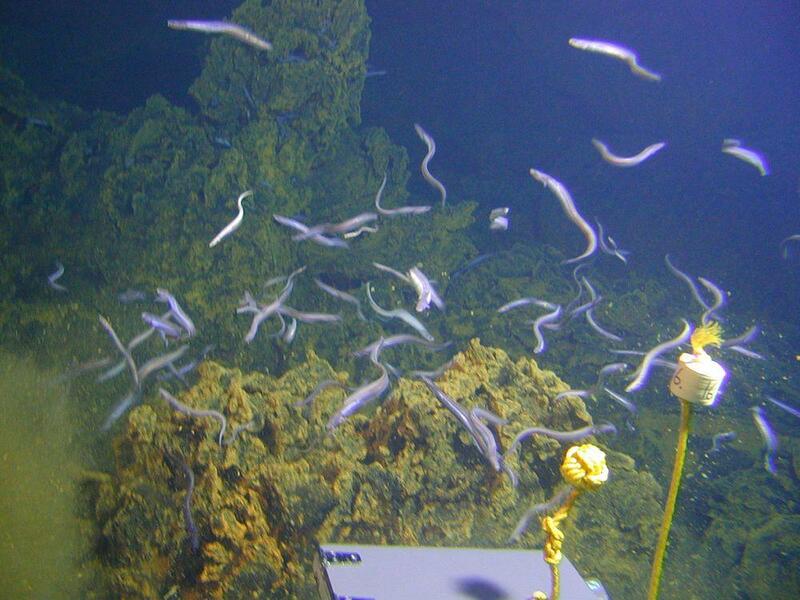 And it is also where the scientist Rich Lutz has tracked the remarkable evolution of bizarre creatures that spawn in hydrothermal vent fluids that are poisonous to most other forms of life.